Every day we hear people complaining how they face water shortage in their locality. 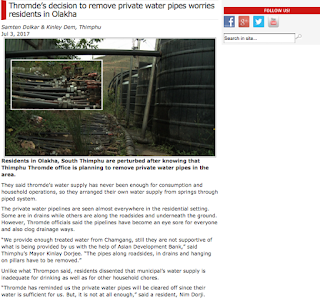 And for a small city like Thimphu, some people feel that our pipes should never run out of the water. While we can tolerate shortcoming sometimes, we should never have a situation wherein we are always after water. So what does it take to have water supply 24/7? I think this can be achieved only if we are good at managing it. 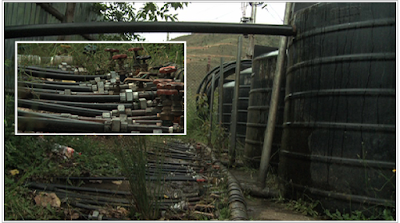 In some places in Olakha and Babesa since the supply by the Municipality is inadequate, private landlords have installed their own pipes to ensure a steady supply to the tenants residing in their buildings. Because having to depend on Thromde’s supply is to have a set of highly frustrated tenants, who will soon move to the next building with better water supply. That’s why our landlords are only being wise. 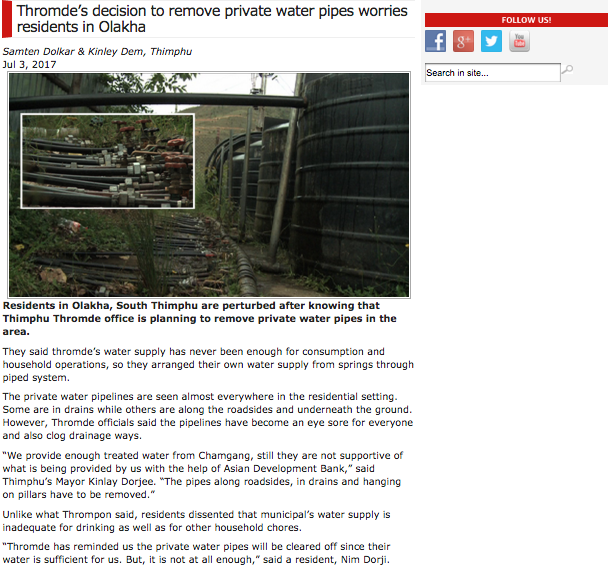 Now Thromde feels that these privately installed pipes need to go. Where were they when these private individuals were digging out and burying their pipes? How can they be illegal now? Yes, we agree that it does not look good aesthetically, but if we have to sacrifice for aesthetic reasons, some families would hungry and sick waiting for Thromde’s inadequate water supply. This was clearly demonstrated a few times at Babesa. Residents had to go on for weeks without water and this was totally inconvenient and unacceptable by any standard. And this goes on without any information to the people living in the area. There is no assurance or confirmation when water will start flowing in our pipes again. I wonder how families that depend on and wait for water twice or thrice a day manage it. Water is a basic necessity and it must be available every day throughout the day. But that’s for another day. And now do we hear that Thromde has enough water for all? In that case even those without consistent water supply we must now demand 24/7. Why not if the source can provide enough for all? Another way to provide enough water for all, I think, is to make use of our rivers. 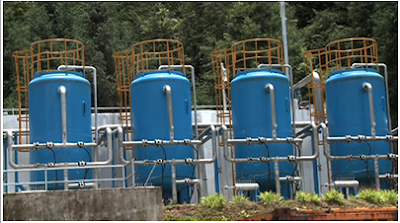 Why can't we pump up water from Thimchu and store in a huge reservoir stationed somewhere from where it can be redistributed to all the residents? 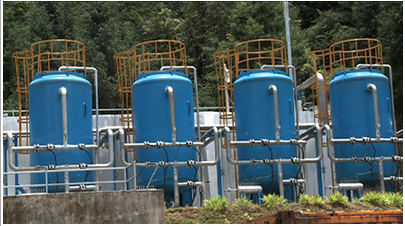 This water can be used to wash clothes, and flush and clean toilets. That way the house owners will be encouraged to arrange different pipes to segregate drinkable water and one that is pumped up from our rivers and streams. That way we reduce the pressure on clean drinking water that flows down from the mountains. But the best way is to create awareness amongst the residents to manage water well and don't waste it carelessly.